We are confident in our capability of completing any and all projects on time, safely, and with excellent quality work. Desert Sands Professional Cleaning is well experienced in all multi-phase construction clean up on many different type of construction sites. Your most difficult cleaning problem is what we do everyday and we want to be part of the solution. 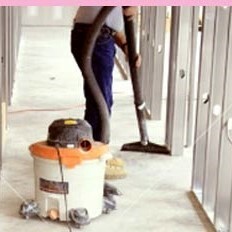 We maintain a large, trained and certified staff that is able handle both small and large-scale clean-up projects. Cleaning all windows, window tracks and remove all stickers, Dusting all walls and light fixtures, dusting from top to bottom, Cleaning inside all closets, closet rods and shelves, Cleaning Inside all kitchen, bathroom and hallway cabinets, Cleaning all baseboards and door frames, Cleaning all sinks, toilets and showers, Cleaning all counter surfaces, Sweeping and mopping all hard surface floors, Vacuuming all carpeted areas and any other special instruction the project manager/owner might have.